In providing expert engineering and testing services to our many client partners in the commercial and military sectors, NTS Fullerton is known for its confident, whatever-it-takes atmosphere. In the NTS network, our Fullerton location is noted for being one of our largest test facilities that’s capable of extreme environmental, mechanical, EMI/EMC and dynamics testing. When it comes to product safety testing and program management, our technicians and engineers are all seasoned experts driven by a fiercely positive attitude that every problem has a solution. Put it all together, and it is clear that we can help you overcome even your toughest challenges. NTS Fullerton bests the competition with an equipment base, and an edge on specialized experience, that only continues to grow. With several employees bringing 20-plus years of experience in compliance to your project, we meet deadlines that others may deem impossible. Our team is full of dedicated specialists with proven track records in their subject matter over many years. No matter your project needs, this highly effective and efficient team is ready to respond quickly with answers and solutions. In 2017, NTS relocated its Culver City team to the Fullerton laboratory. 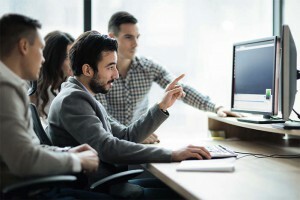 The Advanced Technology Services Group provides a wide range of testing and compliance services, as well as managed services, to the high-tech industry, including computer software and hardware sectors. Originally formed in 1982 to serve the testing needs of the newly emerging computer industry, NTS Culver City has expanded to cover not only existing technologies, such as computer hardware and software, but also smart grid/smart energy technologies, consumer electronics, and telecom devices as well. NTS runs numerous certification programs, including those for USB, ZigBee, MoCA, DIRECTV, Qi, nVoy, and Icontrol, among others. A leader in the computer and consumer testing industries, NTS provides high quality testing services which range from standard hardware and software testing to the development of complex certification and compliance programs for the telecom and other industries. With NTS’s large inventory of test equipment and highly skilled engineers, we can perform most any testing, including compatibility, functionality, interoperability testing, competitive analysis, performance testing, load/stress testing, usability analysis, test plan development, and system integration and certification. NTS can provide the skills and equipment you need to make sure your product is ready for release. NTS can develop or assist in the development of test plans and methodologies, as well as setup and perform testing. Each test project is customized by NTS to meet the needs of our customer. During and at the completion of each test, NTS provides standard deliverables including complete reports of all test cases executed, anomaly reports for each defect, regression reports, final summary reports, and/or other reports based on the actual requirements or customer’s request. It’s our job to make sure that your product release is successful, and we are unparalleled in our ability to assist customers through the entire product lifecycle. NTS specializes in testing products for quality assurance and compliance. Our expert test personnel will exercise your hardware and/or software against the latest industry standards using state-of-the-art test equipment. With decades of experience and extensive hardware and software testing knowledge, NTS is the perfect out-sourced testing laboratory for all your testing needs. NTS also works closely with various organizations to develop, manage, and run certification and/or compliance programs (including USB, WHQL/DTM/WHCK, ZigBee, Multimedia over Coax (MoCA), ISA100.11a, and Sirius XM). With the vast number of industry groups and specifications, it is important that your product function correctly per industry standards. And, if you’re a member of a new standards group, contact us to assist your group in the development of certification / compliance programs. Certification is the best way to ensure a standard’s successful adoption. With the vast number of industry groups and specifications, it is important that your product functions correctly per industry standards. NTS offers a wide array of compliance programs and related test services that not only provides you with expert quality assurance testing but also priced in a way to get you the most "bang for your buck." nVoy Hybrid Networking certification testing - coming soon! program to validate your standard/specification! 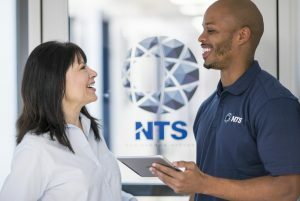 In addition to performing numerous certifications, NTS can also develop a certification or compliance program for your company or standards group. Take a look at the programs we currently offer for testing, and contact us for more information. Be sure to check back regularly as we are always adding new programs. Security – Test to various security standards such as Common Criteria, ICSA, IEEE 802.1x, etc. developed for the ZigBee certification program. Sometimes you just need a couple test engineers onsite at your location. We provide test engineers for specific, discrete projects. These may be one-offs or long term, and may be in any of the various areas that we provided skilled testing, certification or development services for. Say you want to perform USB certification testing of a printer, but your industrial printer weighs a whopping 5 tons. Doesn’t make sense financially to ship that monster to us to perform testing – the shipping alone would break the bank. Let us provide experienced and authorized USB test engineers to come to your location. We can use your test equipment (if you have it) or if necessary bring our own. Obviously, we’re not sending out a test engineer to test a keyboard, but if you’ve a need to have someone onsite, we can accommodate your request. Or you could have a highly anticipated, new product and your security is so high, you just can’t take it out of your facility to our lab. Let us help you out. We can bring the engineers needed to your location to help you with your project. All of our test engineers go through extensive background checks prior to hiring and randomly throughout employment. A Verizon ITL approved facility that can perform numerous GR standards and primary carrier supplemental requirements, NTS Fullerton can adeptly handle all your telecommunications testing needs. We certify telecommunications products such as multiple rack systems, shelf level products, indoor and outdoor equipment network equipment building systems requirements (NEBS) — and all to international standards as well. Capabilities include fire spread, earthquake, wind driven rain, mixed flowing gas and EMC. In addition, NTS Fullerton’s advanced Optics Lab is one of the few with the equipment and knowledge base to conduct testing on Passive Fiber Optic Components and Optical Cable. With multiple switch systems capable of both Single- Mode and Multi-Mode, NTS performs physical and environmental tests while monitoring for Insertion and Return Loss, PMD, PDL, and Change in Transmittance at wavelengths from 850 to 1625 nm. NTS is an NIST designated, U.S. Conformity Assessment Body for EMC. NTS Fullerton has extensive capabilities and experience to conduct Electromagnetic Compatibility Testing (EMC/EMI), HIRF, lightning and electrical testing to military, aerospace, ITE, telecommunications, USB cable and other industry specifications. Radiated Susceptibility (RS) capabilities include up to 7200 V/m to 18 GHz and 200 V/m to 40 GHz. Lightning Transients testing includes multiple-burst, multiple-stroke and pin injection up to level 5 of RTCA/DO-160. NTS Fullerton houses seven fully anechoic and one three-meter semi-anechoic, along with FCC-listed chambers and a copper lined reverberation chamber with state-of-the-art amplifiers. 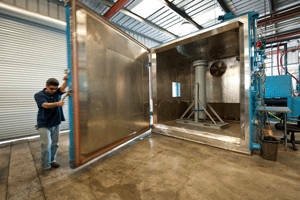 At NTS Fullerton, we offer a wide range of vibration and dynamics testing. With more than 50 years of vibration testing experience, our engineers possess the materials testing expertise to be sure your product is properly prepared for its intended market. We regularly conduct shaker testing to meet military, NASA and ISO standards. Our equipment can generate up to 70,000 force pounds based on tandem shakers and up to 45,000 force pounds on a single shaker. Count on NTS technicians for leading expertise in environmental simulation testing, including thermal shock, HALT, salt fog, explosive atmosphere, dust seismic/earthquake, sine/random vibration, solar radiation, rapid decompression, simulated pyro shock and windmilling. Capabilities include numerous climatic chambers, electrodynamic shakers (which include a UD T4000 and a UD T2000), drop towers and a 28-foot centrifuge. NTS Fullerton has years of experience in the design and performance of materials tests. We can test metal, plastic, composite, rubber and other materials to a broad range of specifications. Capabilities include tension, compression, hardness, shear and bending, peel and tear strength, and flexural strength. Analytical methods such as metallurgical and chemical analysis, FTIR, SEM, ICP and gas chromatography are outsourced to a trusted laboratory and diligently managed through NTS Fullerton. Contact us today to discuss your next test program! Fill in the simple Ask the Expert form or Request a Quote today.